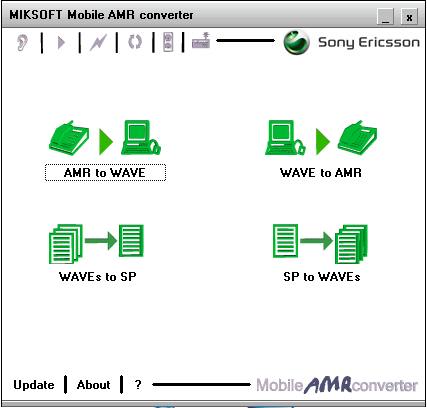 The Mobile AMR converter uses Sony Ericsson AMR converter to convert AMR files (Adaptive Multi-Rate Codec, *.amr) to wave files (*.wav) and vice-versa in a user-friendly way. Also, you can directly convert MP3 to AMR files for use with your mobile. It can also save several wave files into one SP file and vice-versa. The program has a very easy-to-use and simple GUI (Graphical User Interface) that helps even the most amateur user. Most of the times, the only data that you must enter are the input file(s) and the output file. The AMR format is used by many mobile phones right now, for sound recordings and for MMS (message with sound, picture and text for view in cell phones). When I am trying to convert a wave file that I created with Sound Recorder, the produced amr file is only 18 seconds long. What can I do? Just reconvert the wave file to a 16bit 8hz frequency file (mono) with Total Recorder or Winamp. I am trying a WAVE to AMR conversion and I select input and output file (yes, 16 bit wave with 8 kHz, mono) and the MR. I start the conversion, the green thing runs to the right, but after that, it doesn\'t finish. What to do? When I am trying to convert a file an error window appears saying "converter.exe has encountered a problem and needs to close. We are sorry for the inconvenience.". What to do? You probably tried to convert a file that its file name or path contains non-english characters. Try to use a simple path like C:\\Audio.amr . How can I play AMR files on my PC? We suggest you to use our fast and easy Mobile 3GP player to play your AMR or 3GP files. By installing and using an AMR decoder on you PC. The most popular AMR decoder is SPOT xde Player form VoiceAge. You can also use Apple Quick Time 6.4 and above to play AMR files, download it from the Apple web site. The AMR codec is a speech codec. Therefore, if you convert a music file into AMR the quality wont be very good. The only thinkg you can do to improve the quality, is to select a higher bit-rate. When I try to make a conversion the following message shows up: "Windows\\system32\\autoexec.nt. The system file is not suitable for running MS-DOS and Microsoft Windows applications. Choose \'Close\' to terminate the application." SP files are archive files that are used to save several Wave files. You can store and extract wave files in a SP file with MobileAMRconverter. It is a codec offering a wide range of data rates, which was developed by the European Telecommunications Standards institute (ETSI). The AMR codec is standardized for GSM, and is also chosen by the Third Generation Partnership Project (3GPP) as the mandatory codec for third generation systems. The philosophy behind AMR is to lower the codec rate as the interference increases and thus enabling more error correction to be applied. The AMR codec is also used to harmonize the codec standards amongst different cellular systems. Is Mobile AMR converter faster or better than Sony Ericsson AMR converter? The Mobile AMR converter is just a GUI of Sony Ericsson AMR converter, that is offering a user-friendlier and easier-to-use environment than Sony Ericsson AMR converter\'s MS-DOS command line interface. Therefore, Mobile AMR converter has the same conversion performance, speed, and quality as the Sony Ericsson AMR converter 1.2. Which phones are able to play AMR files?